For disclosures related to non-controlling interests, there are a number of cases where companies either choose the more generic item (includes non-controlling interest) versus the more specific or narrow item (excludes non-controlling interest). It would be preferable that companies use the same tags if they do not have non-controlling interests. The following items were raised in regards to this. Which concept represents what amounts to “Total Stockholders’ Equity” in the US GAAP Taxonomy: “Stockholders’ Equity Attributable to Parent” (StockholdersEquity) or “Stockholders’ Equity, Including Portion Attributable to Non-controlling Interest”? Which concept represents “Net Income (Loss)” if a filer has no Non-controlling interest? Is it “Net Income (Loss) Attributable to Parent” (NetIncomeLoss), “Net Income (Loss), Including Portion Attributable to Non-controlling Interest” (ProfitLoss) or “Net Income (Loss) Available to Common Stockholders” (NetIncomeLossAvailableToCommonStockholdersBasic)? In both cases, companies should use the more specific element if it is applicable to them. If a company has no non-controlling interest, they should use StockholdersEquity on the balance sheet and NetIncomeLoss on the Income Statement. If the company has a non-controlling interest, then they will use both StockholdersEquity and StockholdersEquityIncludingPortionAttributableToNoncontrollingInterest on the balance sheet. 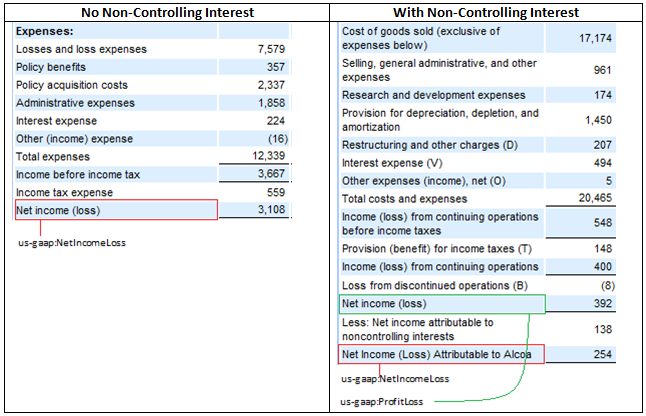 Companies with a non-controlling interest should show both NetIncomeLoss and ProfitLoss on the income statement. StockholdersEquityIncludingPortionAttributableToNoncontrollingInterest and ProfitLoss should not appear unaccompanied by StockholdersEquity and NetIncomeLoss on the balance sheet and income statement, respectively. “Net Income (Loss) Available to Common Stockholders” is a more specific form of net income and should be used instead of NetIncomeLoss when the company does not have preferred shares. From period to period, the specificity of the disclosure may differ. For example, in the current period the company may have preferred shares and in the prior filing period they did not. In the prior filing period, the company should have used “Net Income (Loss) Available to Common Stockholders,” In the current period, NetIncomeLoss could be used to report the amount prior to deducting dividends accrued to preferred stockholders. However, “Net Income (Loss) Available to Common Stockholders” would continue to be used in the current period. This does not apply to the statement of Shareholders’ Equity.